This lesson plan was developed for distribution and launch to celebrate, in part, the National Association for Music Educators’ (NAfME) Music In Our Schools Month (MIOSM) that occurs every March. In particular, this presentation and lesson plan celebrates electronic music, its impact on all modern genres of music, and its importance in our daily lives. More information about MIOSM may be found on NAfME’s Website: http://musiced.nafme.org/events/music-in-our-schools-month/. 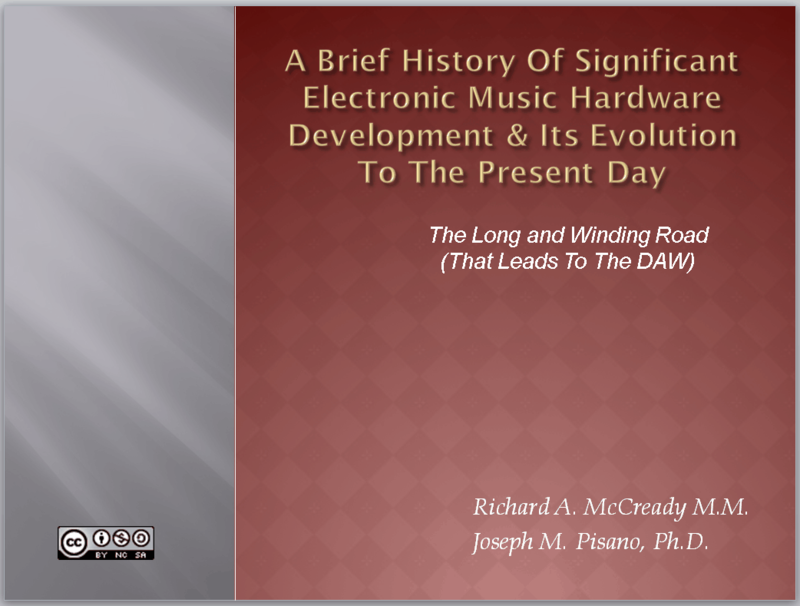 The presentation and lesson plan provides a succinct history of the achievements in electronic music and recording, outlines some of the significant technology advances that predicated today’s Digital Audio Workstations (DAWs), and serves as a reminder about how all types of music are important and appropriate for studying and performing within our schools and communities. The entirety of the presentation utilizes open-source resources and is licensed under the Creative Commons 3.0 No-Derivatives and No Commercial Use License. To find out more details and specifics about the project, please view the Teacher guide PDF. This presentation is free to share and use for any educational endeavor. Joseph M. Pisano, Ph.D. is currently the Associate Chairman of Music and Fine Arts at Grove City College where he is an Associate Professor of Music and Music Technology and serves as the Associate Director of Bands. Grove City College is a private, four-year college located in Grove City Pennsylvania. Prof. Pisano is an active instrumental ensemble conductor, guest conductor, ensemble adjudicator, jazz trumpeter, technology expert, and Arts Advocate. His academic degrees include: a Bachelor of Music Degree and Public School Teaching Certification from Grove City College, a Master of Music Degree in Instrumental Conducting from the State University of New York at Binghamton (S.U.N.Y), and a Ph.D. from Kent State University in Music Education with a Doctoral Minor in Instructional Technology. His professional memberships and honoraries include: ABA, NAfME, NBA, ISME, PMEA, TI:ME, Pi Kappa Lambda, and Phi Beta Mu. Dr. Pisano has written numerous articles, books, curriculums, and iPad/iPhone applications; he is highly sought after as lecturer and clinician. He currently serves as the Music Education Guide writer for In-Tune Monthly Magazine and DCI magazine, is the TI:ME 2011 Teacher of the Year, recipient of the 2011 Citation of Excellence from PMEA, and is the founder of many popular music, education, and technology websites. Richard A McCready, M.M. is a composer, musician, and the Director of Music Technology at River Hill High School in Columbia, Howard County, Maryland. He also serves Howard County as the Resource Teacher for Music Technology. Mr. McCready was born in Northern Ireland and studied tuba performance, piano, and composition at the Royal Northern College of Music, Manchester, England. He began his teaching career at Frodsham High School in Cheshire, England. Since emigrating to the United States in 1992, Mr. McCready has held teaching positions at The Park School of Baltimore, Towson University, and Mayfield Woods Middle School, Elkridge, MD; he has also played professionally with the Monumental Brass Quintet, the Lexington Brass Quintet, and the Denhard/McCready Duo. Mr. McCready has earned two Masters degrees from Towson University, one in tuba performance and one in vocal performance. He plays many musical instruments, but the focus of his teaching is Music Technology in which he is widely regarded as one of the outstanding innovators in the US. His book, Making Music with GarageBand and Mixcraft, was published in 2010. 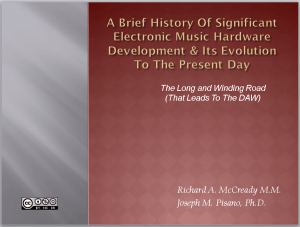 Students will learn about the preceding developments in music technology that have led up to the development of today’s modern music electronics and Digital Audio Workstations (DAW). They will explore each of the significant developments along this timeline and be able to make connections between how each one relates to one another and often leads directly to the development of the next. Complete lesson plan details including National Standards met, lesson plan details, assessments, resources, and more may be found in the Teacher’s Guide (PDF).